DES MOINES – The Iowa Barnstormers are happy to announce the Re-Launch of their Kids Club for the 2011 season. Officially known as the “Lil Stormers” Kids Club, it provides a great way for the youth of Iowa to interact with and learn about the day to day activities of their favorite team. The Re-Launch of the club features several upgrades over the original club, including the new partnership with Sam & Louie’s Pizzeria as an Official Sponsor. Sam & Louie’s will provide special discount and free items to all members of the club. In addition, Sam & Louie’s will host the Official 2011 Barnstormers Kids Club party later this season. Sam & Louie’s is located at 8561 Hickman in Urbandale and features New York style Pizza along with various pastas, sandwiches, salads and a full catering menu. 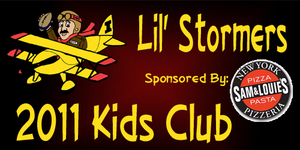 The “Lil Stormers” Kids Club is open to kids ages 2-14. The cost of the club is $15.00 and includes a t-shirt, ticket to one 2011 Barnstormer home game, membership card, newsletter, noisemaker, birthday card, autographed player photo, the official party at Sam & Louie’s plus much more. The Barnstormers are offering a membership discount price of $10.00 for season ticket holders and their immediate families. Sign ups are being taken now Click HERE to sign up!